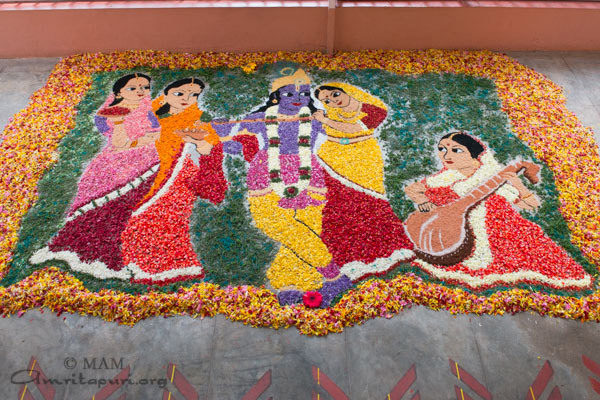 For the past ten days of Onam, portico in front of Amma’s house were daily decorated with different floral designs. Ashram residents, devotees and students did the Pookkalam. 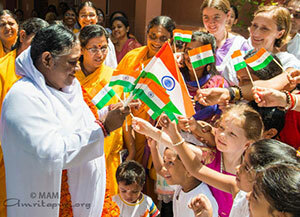 Amma to visit Europe from 6 Oct to 11 Nov holding programs – Satsang, Bhajan and Darshan – in 10 cities. Address: Palau d’Esports, Avinguda Francesc Macià, 160, E-08401 Granollers, Barcelona. Address: Kulturhalle Zenith, Lilienthalallee 29 (Freimann), 80939 Munich, Germany. 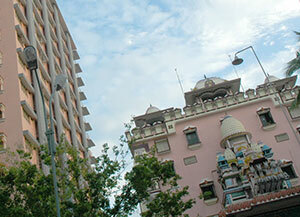 Address: Eulach Hallen, Wartstrasse 73, 8400 Winterthur, Switzerland. Address: Hall Saint-Martin, Parc des expositions de Cergy- Pontoise, Chaussée Jules César, 95300 Pontoise. Address: Big Hall at Hof Herrenberg, Hof Herrenberg 1, 64753 Brombachtal, Germany. 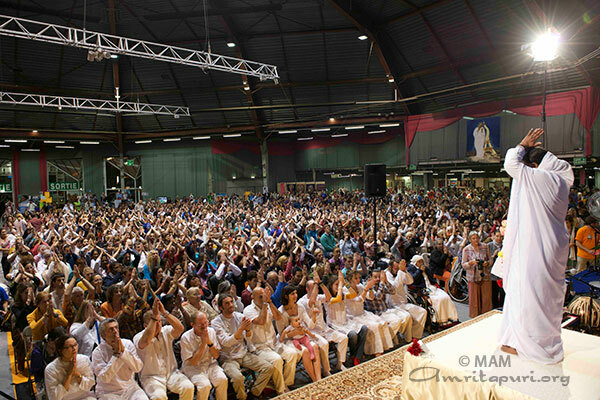 Address: Expo Houten, Meidoornkade 24, 3992 AE Houten, Netherlands. 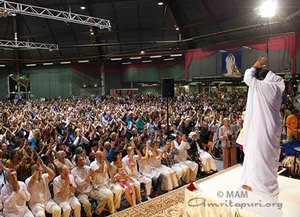 Address: Energy Hall, Rajatorpantie 23, 01600 Vantaa, Finland. Address: Salle Zenith Omega, Boulevard Commandant Nicolas, 83000 Toulon, France. Address: Centro Congressi ed Esposizioni Malpensafiere, via XI Settembre, 16 – Busto Arsizio (VA). Address: Alexandra Palace, Alexandra Palace Way, Wood Green, London N22 7AY. Today is ‪RakshaBandhan‬ – a day when brothers and sisters and celebrate and honor their bond between each other by tying the traditional rakhi bracelet around each others’ wrists. In this way, the sister expresses her love for her brother, and her brother pledges to look after her in all circumstances. But the tying of a rakhi is not confined to a brother and sister but to Guru too. Many devotees celebrate Raksha Bandhan at Amritapuri today by tying a rakhi bracelet around Amma’s wrist — Amma lovingly obliges each request. 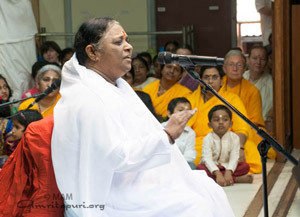 The following has been extracted from Amma’s Onam message. 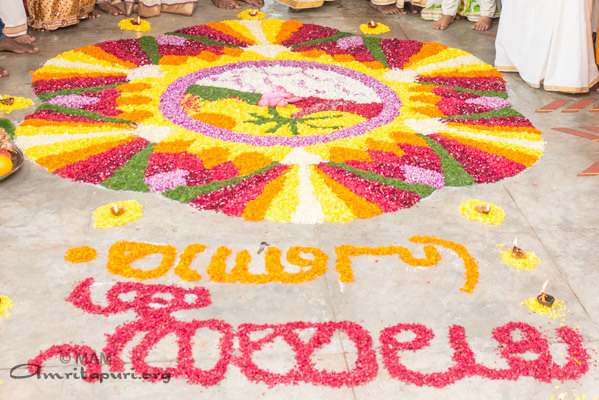 Onam is a festival of unity and sharing. A festival takes place when our heart overflows. 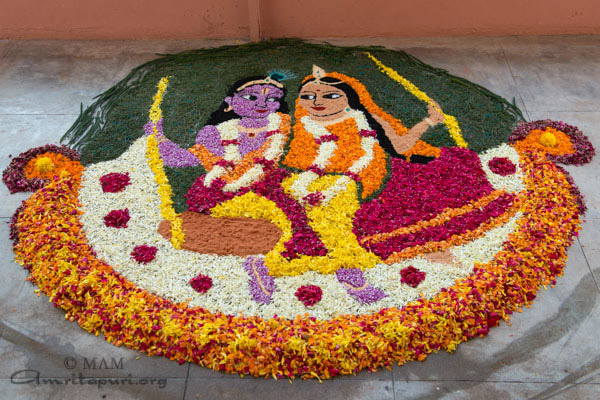 Onam is a time when joy, love, kinship and devotion overflow. The breeze of Onam starts caressing us as soon as the Malayalam month of Chingam starts. 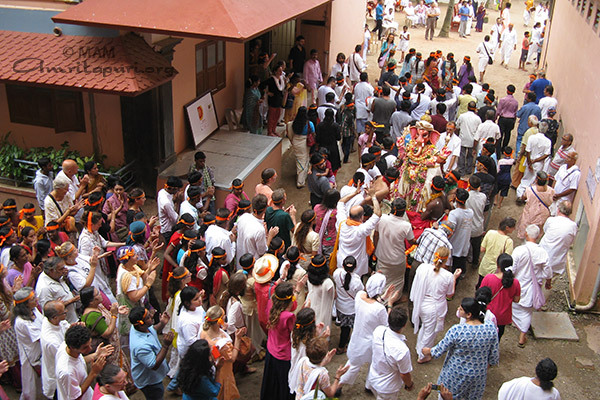 In fact, people begin to feel joy even in the final days of Karkitakam. The rays of the sun start piercing the clouds in the sky. Flowers everywhere start smiling. Butterflies start flitting about. There is only joy everywhere. Here, we share that joy and love with others. Happiness increases when we share it with others. All of us rejoice when the month of Karkitakam ends and Chingam begins. 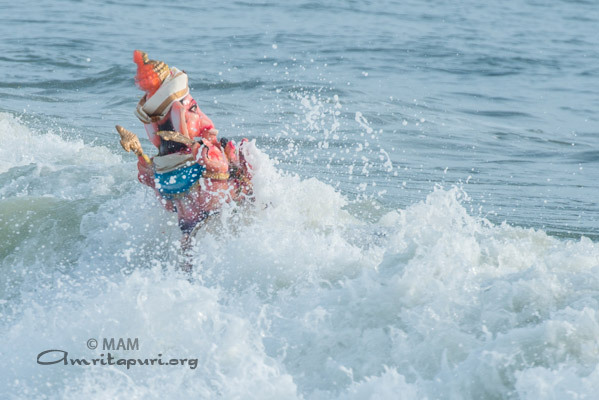 Karkitakam is a time of spiritual practice and austerities when we stay home and worship God. 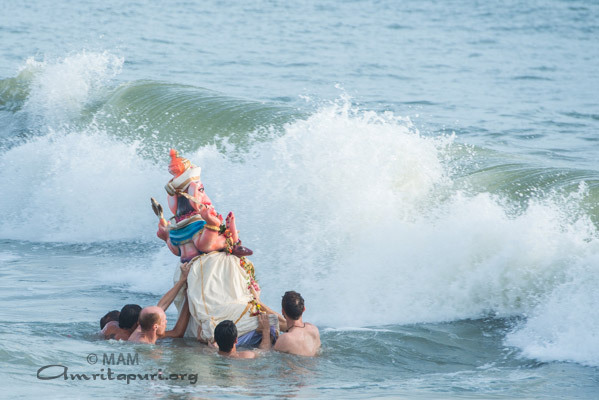 While the earth bathes in the monsoon, Keralites bathe in the Ganga of Wisdom that is the Ramayana. 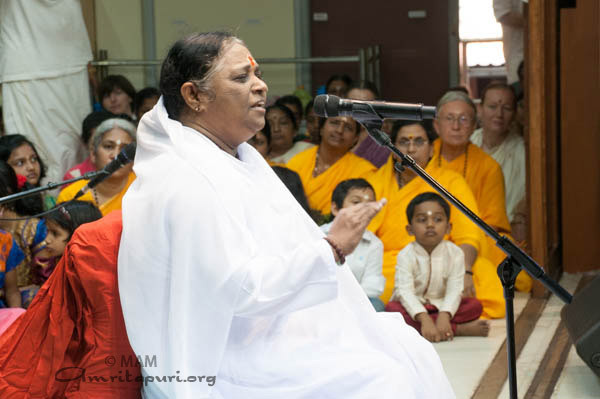 Sometimes, without thinking we may curse the rains of Karkitakam, but we must never forget that it is only because of the torrential rains of Karkitakam that we have the flowers and harvests of Chingam. Moreover, it is the month of rain that helps us to appreciate the following beauty of Nature. This shows us that behind every celebration lies a period of sacrifice and austerity. All of us are experiencing our own little pains and sorrows in life. Nevertheless, amidst all these, we still usher in Onam with joy. How is it possible? Happiness is a decision. If we so decide, we can create an empire of happiness. This is because happiness is our true nature. The lamp of happiness is ever aflame in our hearts. We must take care not to block this light with the closed curtain of our desires. At present, climatic patterns are changing. It is becoming hotter. There is less rain. The seasons are becoming erratic. In order to live in harmony with Nature, one should love all beings. One must uphold dharma. 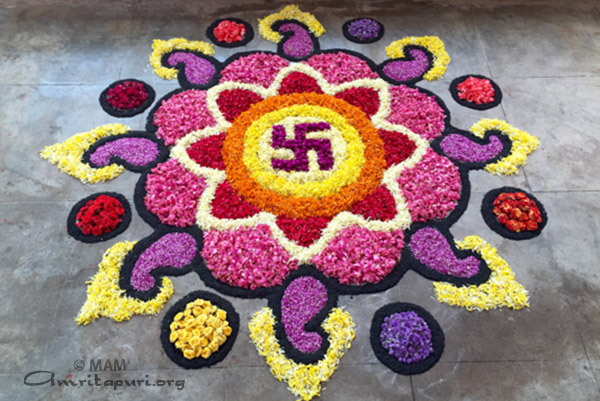 Dharma used to be the very heart of Onam. Our estrangement from our culture of dharma is the reason for all these irregularities. In the past, people were content with what they received. They were able to find contentment in small things. 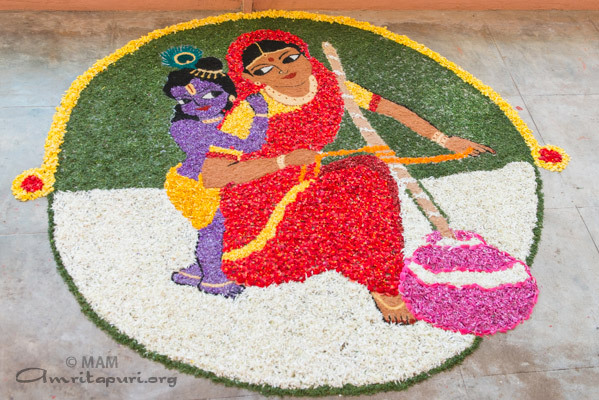 This is the very message of Onam—the message of sacrifice, simplicity and charity. 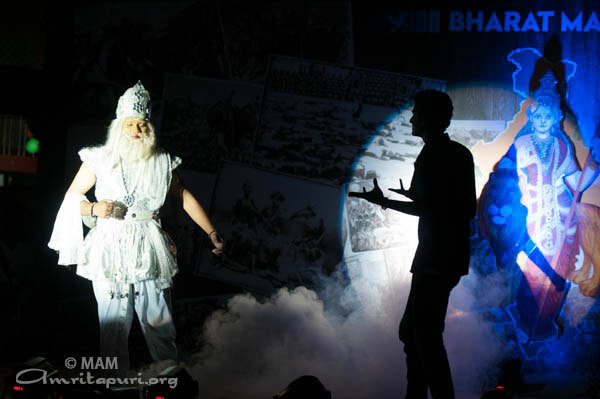 The story of Mahabali is also a tale of sacrifice and austerity. It is only because of Mahabali’s self-sacrifice and surrender that he is still remembered today. Each year, we welcome him along with the Lord. Even though Onam actually is the day when Lord Vishnu incarnated as Vamana, we think of Mahabali more than the Lord. This reveals the greatness of devotion and sacrifice. However, initially, there were flaws in Mahabali. He thought all of his accomplishments were exclusively due to his effort. Having such an attitude is like allowing salt to fall into milk; it ruins any sweetness. It is the Lord’s duty to save His devotee from such a predicament. In the end, Mahabali was discerning enough to realize his folly. With this realization came total surrender. His life also teaches us that we must realize our own follies and strive to correct ourselves. After he had surrendered everything, all that Mahabali asked the Lord was that he be able to see his subjects happy. Mahabali’s love was not confined to words. He did not have any selfish ulterior motive. Such love is very rare in the world today. Many speak loving words but their intentions are impure. We have heard it sung that during the time of King Mahabali’s reign, all people were considered equal, but that equality was not merely external. It indicates an internal equality—an equal vision that comes from knowledge. External circumstances will constantly change. Happiness will alternate with sorrow. We should try to cultivate an attitude of equanimity and acceptance. As Onam approaches, we usually see the liquor sales soaring. The Kerala Government’s ban on liquor is a good step. However, this ban will only become effective and complete when there is an internal change in man. In olden days, Onam itself was our intoxication. However, today, so many people get drunk on Onam that they consider that to be the bliss of Onam. People in Kerala annually consume more liquour than those in any other state. Alcohol is destroying our health as well as our relationships. If the person drinking is from a poor family, the family is financially ruined. 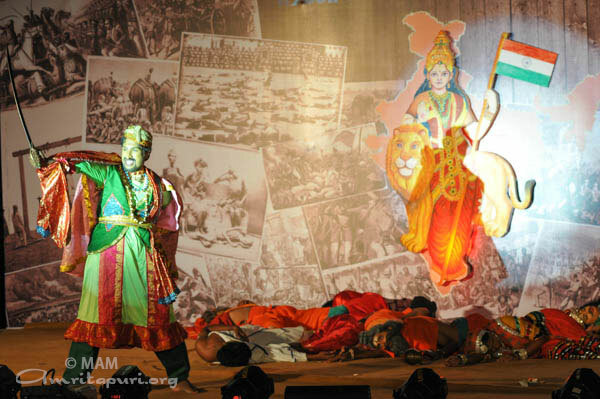 Onam celebrates the memory of a past golden age. We also have the hope that such a golden age will return in the future. 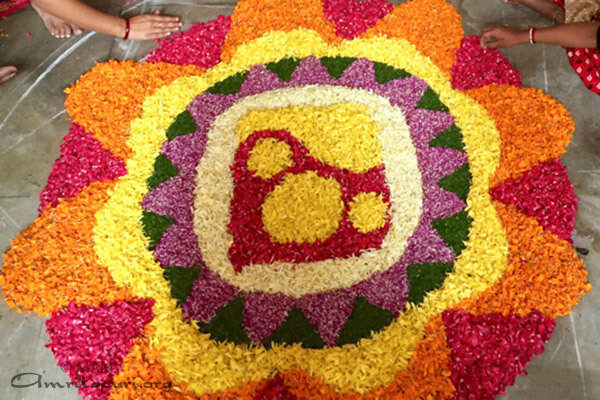 However, what happens when we get into the celebratory mood of Onam? We forget both the past and the future and live completely in the moment. In fact, life exists only in the present moment. The present moment is our only wealth. We should strive to properly utilize it, with awareness and alertness. 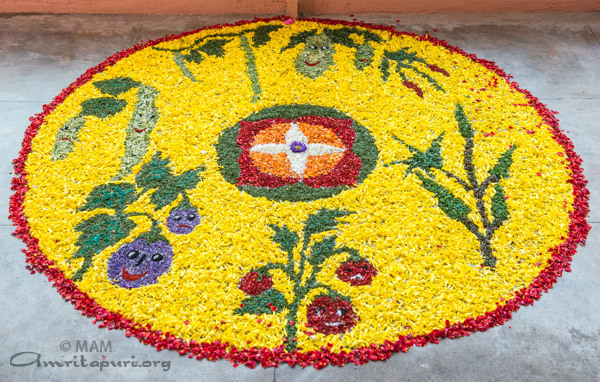 Whenever we do this, the spirit of Onam will immediately awaken within us. Any memories of the past we have should awaken only positivity in the present. This means that we should try to remember only positive things people have done for us. Remember how they may have encouraged us or helped us. Try to draw energy from such memories and live in the present moment. What is essential is to make the present moment meaningful. If we do this, our life will naturally be filled with new sprouts, flower buds, blossoms and fruits. Happiness and prosperity will pervade. 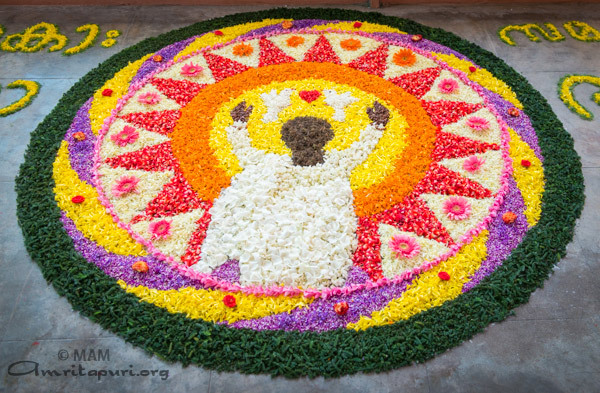 The spirit of Onam will be there for us every day. 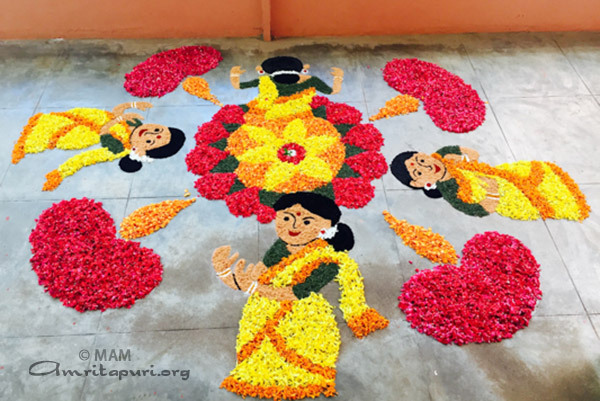 Onam is a symbol of external and internal beauty. Happiness and beauty will be present only in a mind that is devoid of negative emotions. Therefore, may the shadow of negative emotions such as hatred and sorrow leave our minds. Instead, let our minds be filled with the golden light of love and happiness. Let the dark clouds of poverty and conflict lift, and let the world awaken to a new dawn of peace and prosperity. 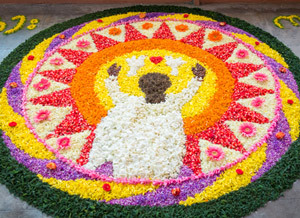 In this way, let the true message of Onam spread all across the world. May Onam be continuously celebrated in the mind of humanity. May the Paramatman, shower grace for this to happen. 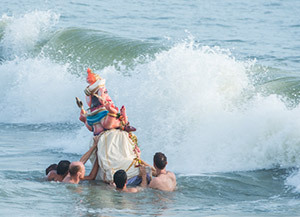 After being kept in the puja for the past 10-days, the Ganesha statue was taken in a procession. 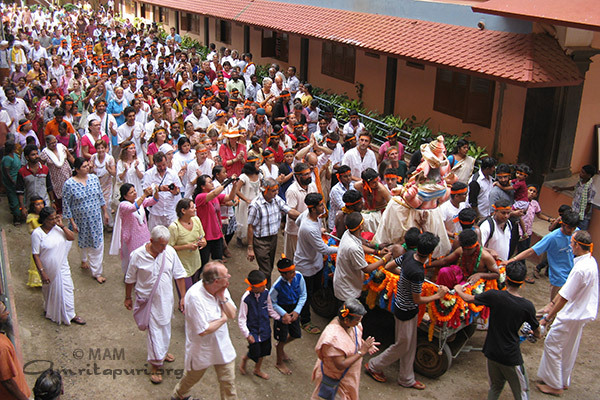 From Kalari, around the Kali Temple towards the main hall Ganesha was carried with fervent bhajans and Panchavadyam, while Amma is giving darshan. 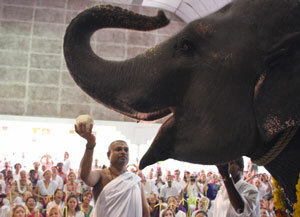 Ashram elephant Lakshi also followed. Then it was carried to the sea for immersion. 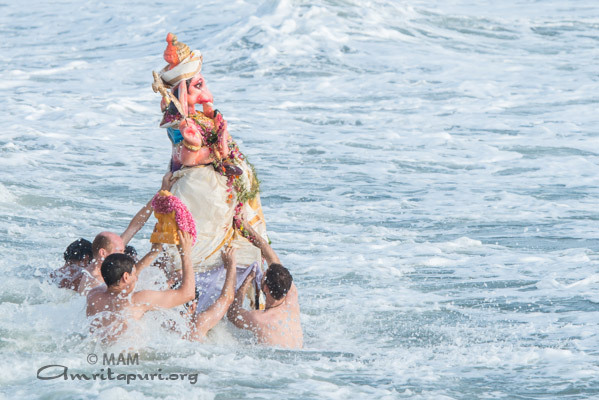 With the chants of Ganapati Bappa Moriya the idol was submerged in the ocean – reminding us that all names and forms are will merge in the consciousness ultimately. 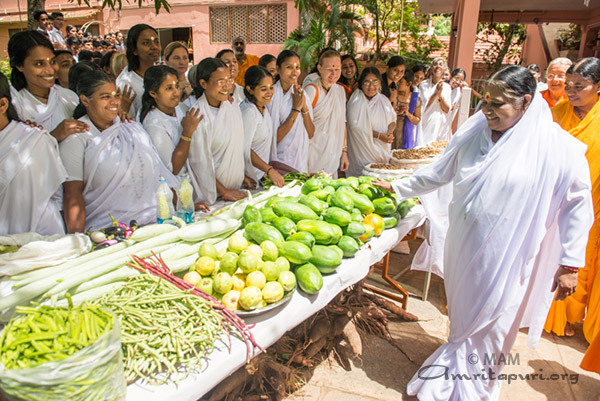 For many years now, Amma has been encouraging all her followers around the world to grow their own organic vegetables, both for personal health and for a healthy planet. 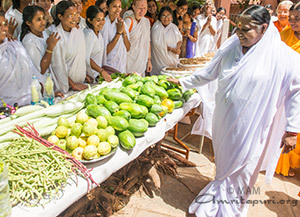 Today, Brahmacharis and Brahmacharinis and other residents of Amritapuri presented Amma organic vegetables they have lovingly cultivated by hand for use in tomorrow’s massive traditional ‪Onam‬ meal, which Amma will personally serve to each of the many thousands of people who have come from all over India and around the world to celebrate Onam at their spiritual home. 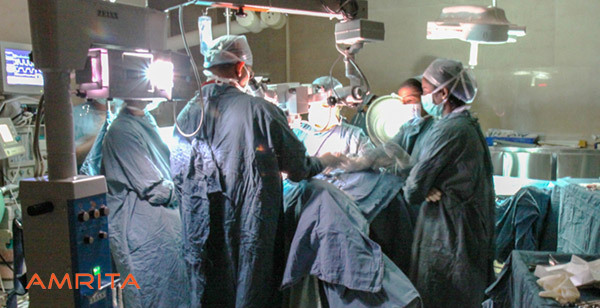 Amrita Institute of Medical Sciences & Research Centre has unveiled a Centre of Excellence in Fetal Care for open fetal surgery – the first in Asia for treating complex and rare fetal conditions. 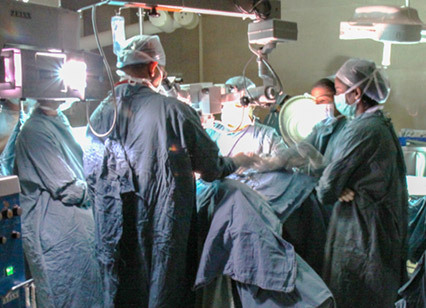 With this, India becomes the fourth country in world after USA, France and Spain to offer open surgery on fetus. The Centre has already done EXIT procedure for a baby with a swelling in the neck. The baby’s head was delivered from the womb, fluid from the swelling removed and a tube was put into the windpipe to enable breathing. Amrita Centre of Excellence in Fetal Care has a dedicated fetal care team including experts from Fetal Medicine, Perinatology, Obstetrics, Paediatric surgery, Paediatric Genetics, Paediatric and Fetal Cardiology, Paediatric Neurology & Neuro Surgery, Paediatric Cardiothoracic Surgery, Human cyto-genetics, Biochemistry and Fetal pathology. The Centre offers every aspect of fetal care from conception to delivery and complete postnatal care. 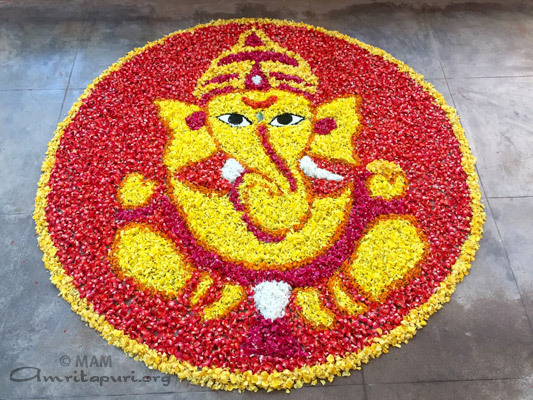 Ganesh Chaturthi festival was celebrated in the Ashram with much devotion and enthusiasm. 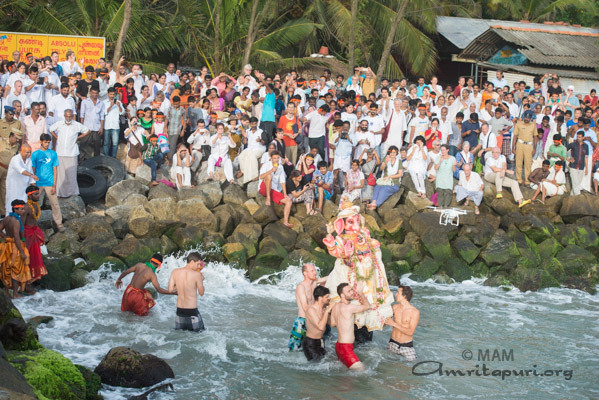 After the Ganapati Homa in the Kalari, a special puja was held to worship the Lord in the form of an Elephant, in this case the Ashram elephant Lakshmi. 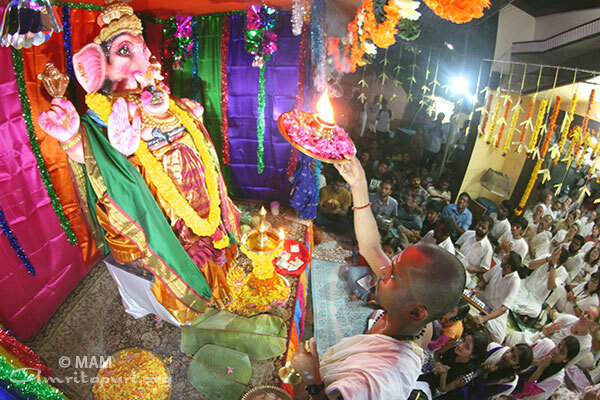 An idol of Ganesh has been kept in front of the Kalari, and daily evening bhajans are sung by a group of enthusiastic devotees after the regular ashram bhajans. 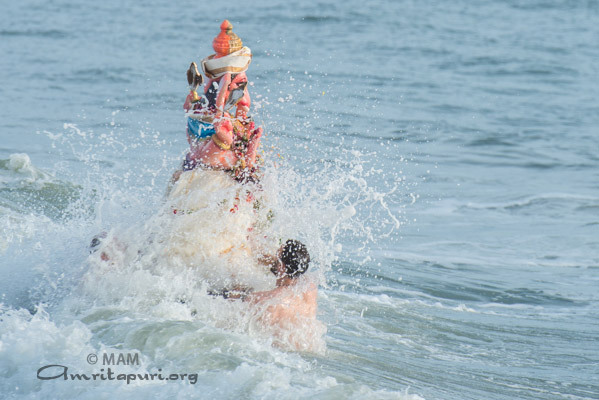 On the tenth day it will be taken to the sea for Visarjan (immersion). 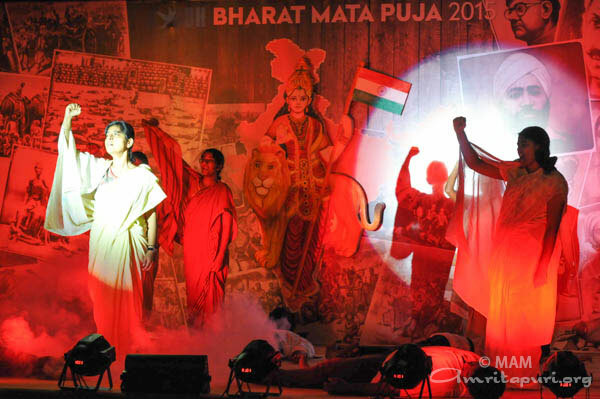 AYUDH Amritapuri performed the play ‘Bharat Mata Puja 2015’ in the main hall, while Amma was giving darshan. 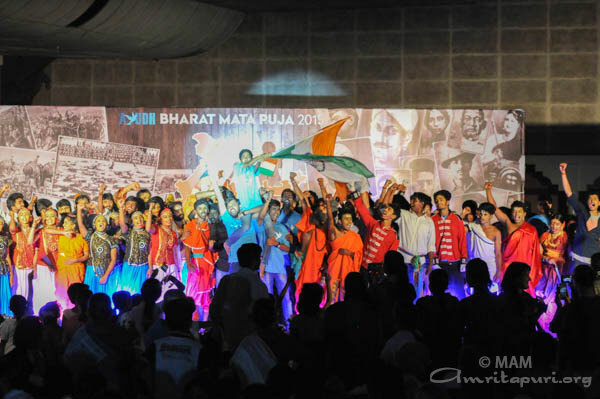 This night play was in connection with India’s Independent day celebrations. 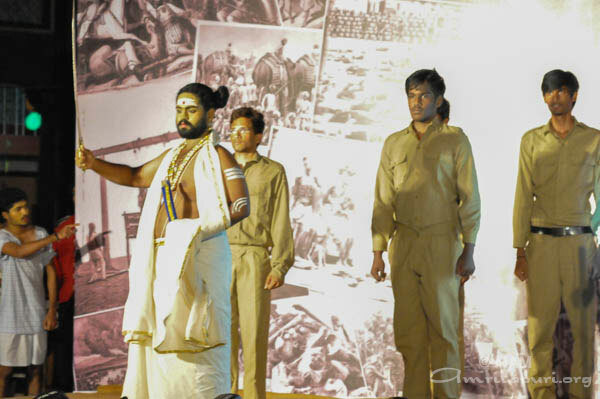 The play was based on the un-sung heroes of the freedom struggle. 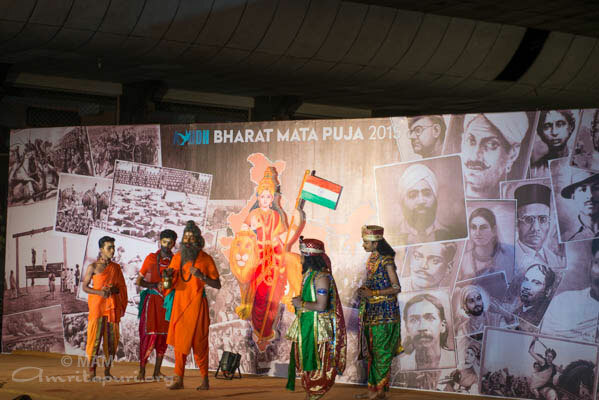 After the 40 minutes of play, the hall reverberated with the chants of ‘Vande Mataram’ and ‘Bharat Mata Ki Jai’. 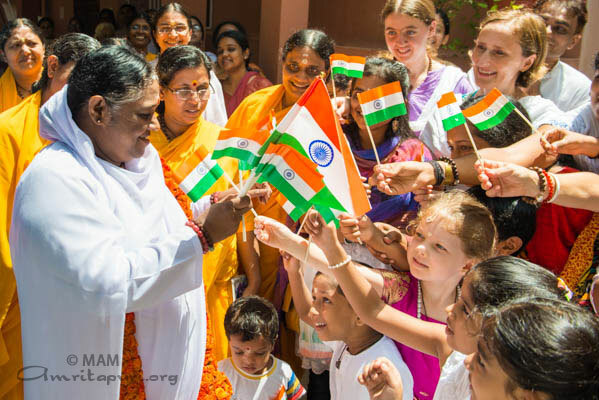 One girl dressed as Bharat Mata, took the National tri-colour flag to Amma which she accepted and waved with such joy and innocence of a child. 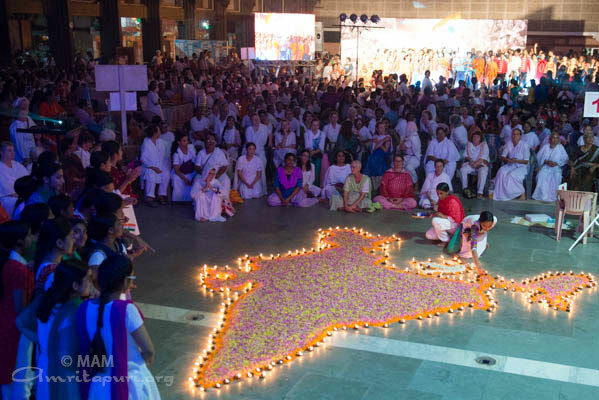 The youths also made an India map with lamps. This celebration of ‘Unity in Diversity’ could create respect and love the hearts for the Motherland. Earlier in the day AYUDH also conducted Amalabharatam, a city cleaning program in Vallikkavu town.